Some might say Fog Creek wrote the book on technical recruiting because, well, our founder Joel Spolsky, wrote the book on technical recruiting. About 10 years ago, “Smart and Gets Things Done” went out into the world. Today, it’s still one of the most trusted guides for organizations looking to attract and hire great technical staff. But, a lot has changed in those 10 years about the tech industry and how we need to recruit people today. Here at Fog Creek Software, we’ve spent a lot of time reflecting on the most common hiring practices. What we realized is that while many of these methods were once considered effective, they actually perpetuated the biggest representation problems in the industry. For instance, we were huge proponents of hiring interns — but we only recruited students from the most prestigious universities (with the most well-known Computer Science programs). When interns proved to be highly skilled, we offered them full-time jobs before they could hit the open market. We were hiring great developers, but they were also primarily white men. We tried a few things to change this, including our partnership with the Flatiron School. We recognized that there are many paths to a career as a developer, and we hoped that this initiative would communicate that to non-traditional candidates. But one initiative was never going to be enough, we were committed to the hard work of implementing recruiting practices that correct the representation problem that runs rampant in the industry today. So we did even more homework. And we all agreed that the next step was to rewrite our job listings so that they more accurately reflect the supportive culture and values we have at Fog Creek. We were especially interested in improving the “candidate experience” section of each of our job listings. We tried to be as clear as possible about what the actual requirements were, and which skills were more in the “nice to have” category. Doing this enabled us to avoid using terms like “Junior” in our job titles, which are the types of words or phrases that typically suggest a company is only looking for a young, recent grad. We also decided that living up to our commitment of transparency meant we needed to disclose salary ranges for every open position. Fog Creek was already in the midst of re-implementing an open salary policy internally, so this change was fairly simple to make to our job listings as well. But transparency also meant that we needed to be as honest as possible about the downsides of working at Fog Creek. Yes, the downsides. We were particularly inspired by this job listing for the Recurse Center. Not only does it include an informative description in an easy-to-read format, they even listed the pros and cons of the position! Calling out the downsides of a position is gutsy, but it’s required if you really want to be transparent and it has worked well for us. 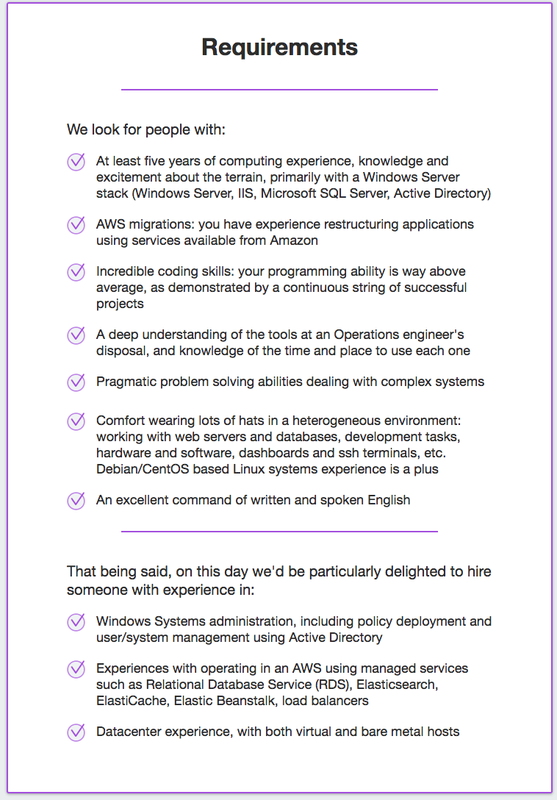 Take the DevOps position we were looking to fill, for example. We knew that our legacy infrastructure would present a unique challenge, and we wanted to be open with candidates about it. In a not-so-surprising turn of events, the pros and cons brainstorming exercise actually led us to realize that what we really needed on the team was a DBA! It’s in this spirit of thoughtful evaluation that we continue to write honest job listings about every open position at Fog Creek. As difficult as recruiting can be for employers, the experience can be even tougher on candidates. Far too many companies expect candidates to make time for day-long interviews, without giving them the information they need in advance. For someone who’s juggling coursework, managing care-taking responsibilities, or you know, wants to have a well-rounded life, this can be particularly frustrating. That’s why we also expanded the “What to expect when you apply” section, which details the potential time commitment and process for prospective candidates. 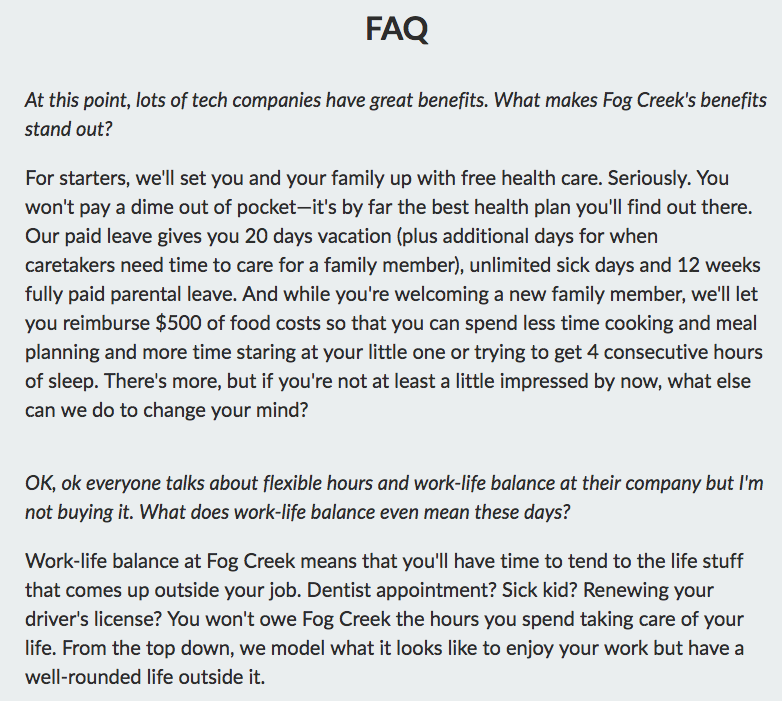 Additionally, we added FAQs about our amazing benefits and how they actually play out on a day-to-day basis. In addition to the responsibilities themselves, we think these are significant factors when candidates are deciding whether or not they should apply for a role. After all this work on the job listings, the next step was to post it in places the right candidates would see and, then hopefully, apply. Some boards we love are Tech Ladies, a supportive community over 20,000 strong, and Blacks In Technology, a professional platform for PoC in tech. We’ve also put more effort into reaching non-traditional candidates through our connections at established coding schools and, of course, Twitter. This is just a start to improving our processes and there’s still a lot of work to do. It’s also too early to tell the exact impact these changes have made, but anecdotally at least, so far they’ve been well received.